What makes a "good" pro scooter wheel? A question we get asked all the time is "What's the difference between good pro scooter wheels and bad ones?". We will do our best to try and answer that! Most entry level scooter wheels have either plastic or metal cores with urethane treads, most high end pro scooters will have metal core wheels. 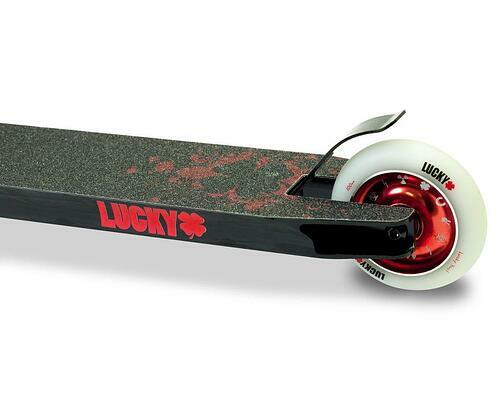 Here at Lucky we only manufacture metal core scooter wheels. Metal cores are stronger and more durable than plastic and are therefore better suited for advanced riders. A very important part of the wheel is its size. Size of the wheel refers to the diameter or how tall the wheel is. Most scooters wheels are 100mm or 110mm in diameter. The taller the wheel the longer it takes to get going, but you will have a faster and softer ride, its all about cruising and speed. Smaller wheels are slightly more maneuverable. Do I need a metal core? Metal cores are made to hold up better than plastic cores. Freestyle scootering is pretty rough on the equipment. If you’re jumping and whipping your scooter around on a street course or at the skate park then you’ll want wheels that stick better, roll better and are made to handle the abuse. Bearing spacers are short metal tubes that sit between the bearings of scooters wheel. Their job is to allow you to tighten the axles of the scooter without sacrificing spin. This is because the spacers keep the bearings seperated and true by exerting internal pressure against the external pressure of scooter forks and decks. Bearings are inserted inside the wheel core and consist of a metal housing that is pressed over a row of ball bearings that circle the metal housing. When a wheel is rolling, the action of the ball bearings rolling against the surface of the hub that allows the wheel to spin smoothly. ABEC is a rating scale for the tolerances of precision bearings. The higher the number, the tighter the tolerance, the better your scooter performs.